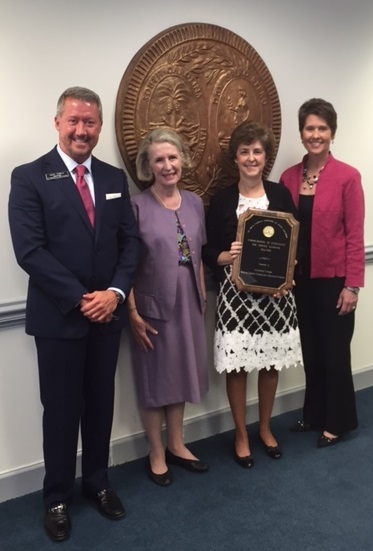 On May 7, the South Carolina Commission on Higher Education (CHE) presented the 2015 Service Learning Awards. The awards recognize institutions of higher education that have implemented a course or program which focuses on hands-on resolution of community issues followed by analysis and reflection. Three institutions received awards, presented by CHE commissioner Temple Hood. Columbia College received the award in the independent institution category. Piedmont Technical College was awarded in the public, two-year category, and the Medical University of South Carolina was awarded in the public, four-year category. Columbia College’s entry, “Healing Species Compassion Education Program” was rolled out in the pilot stage in August 2014 and became a full-fledged program in January 2015. Students in Liberal Arts 201 learn about key issues that impact social justice, gender roles, and diversity. Then, they teach lessons and lead activities at the Healing Species Violence Prevention and Compassion Education course at CME/Ebenezer Lutheran’s Teen After School Program. Healing Species is an 11-week course targeting elementary and middle school children, who are referred by the Department of Juvenile Justice, teachers or family members. In addition to this hands-on service, the Liberal Arts 201 students keep reflective journals and write a course paper integrating what they have learned from their preparation and community service. Dr. Laurie Hopkins, V.P. Academic Affairs, Dr. Helen Rapoport, Director of the program and English Lecturer, and Dr. Nancy Tuten, Head of the Division of Languages and Literatures, were present to receive the award. We congratulate Columbia College for successfully integrating this service learning course and for their recognition from the CHE.